A flat piece of land, raised bank, or terrace-looking thing by a river or canal. That is more-or-less the definition of what a “berm” is. Or so says the internet. Regardless, it seems like a fun place to ride a motorcycle. 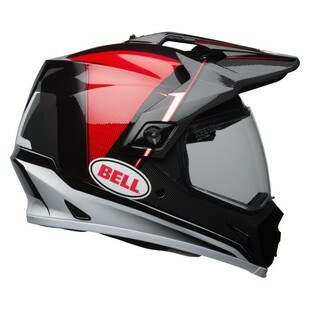 With the Bell MX-9 Adventure MIPS Berm Helmet, riders get a lid that would be equally as fun to wear. With a high-contrast graphic, tons of features, and a mid-range price point that makes it attainable for most riders, the MX-9 Adventure MIPS Berm graphic has a ton to offer. Designed to live in the zone between the off-road and on, the success of the MX-9 Adventure over the years stands as a testament to its well-constructed, construction. When you throw in the fact that it comes with the Multi-Directional Impact Protection System, this lid only gets better. Additional features include DOT & ECE safety certifications, a five-year warranty, and a lightweight polycarb shell. Regardless of where you ride (whether it is on a terrace by the water or on your local street), the Bell MX-9 Adventure MIPS Berm Helmet is a great place to start your search for a baller helmet.